To transfer your GoDaddy domain to another registrar, you might need an authorization code (also known as EPP code or transfer key). An auth code is extra security that confirms you own the domain name. Select the domain you'll be transferring to get to the Domain Settings page. 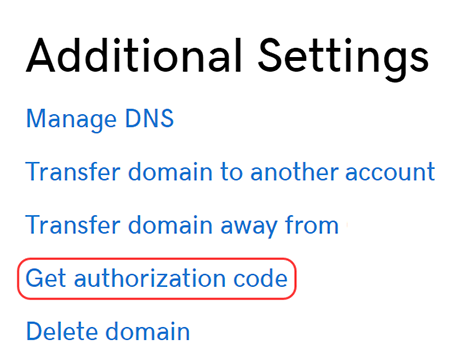 Scroll down to the Additional Settings section and select Get authorization code. Note: If this option shows Disabled, your domain might be within 60 days of registration or a previous transfer, or opted-in to apply a 60-day transfer lock after a Change of Registrant. The auth code will be sent to your administrative email address. Don't remember your email? Review your domain contact information. Now that you have your authorization code, you can transfer your domain to another registrar. Haven't received your authorization code? You can download your code instead.